Whether you are currently wearing braces or looking into getting some, knowing what your life with braces will look (and feel) like can help you prepare for success and choose the right form of treatment for your needs and lifestyle. Belmar Orthodontics can help educate you on what to expect and what you can do now to achieve your best outcomes. Before you leave our office, we perform a thorough check to help minimize any discomfort you could have at home adjusting to your life with braces and to help you get the results you need and want. We will have you check the wire ends with your tongue to make sure nothing is poking or rubbing your cheek in a way that could cause irritation. We will also supply you with dental wax to place on brackets or wires that cause you any discomfort while your mouth adjusts to the apparatus. Dental wax is a helpful tool during your life with braces. We will show you how to use it before you leave our office the first day you receive your braces. Dental wax is made from a mouth-safe, silicone substance that can be applied over your braces to create a smooth surface relieving irritation that can be caused by wires or brackets in your mouth. We will also supply you with tools to help you keep your brackets/teeth clean. Floss threaders and proxy brushes are essential for getting trapped food out between your teeth. You don’t have to wait to eat after you leave our office, but you do need to stick to the “food rules” while wearing your braces. The bonding glue used for attaching the brackets to your teeth dries extremely quickly but takes about 24 hours to fully set. During this period, it is especially important that you avoid foods (or habits) that could dislodge your brackets. Dr. Hardy will review with you the foods/habits to avoid while you have your braces and you can also refer to our patient education section of our website at any time to remind yourself. While you adjust to your new life with braces, it can be helpful to modify your diet and rely on softer foods. Some of the recommended food choices during this adjustment period are: cooked pasta, soup, soft bread, yogurt, pudding, boiled vegetables, mashed potatoes, shakes, and scrambled eggs. While the process of receiving your braces is pain-free, you can expect to have some mild soreness or discomfort after your archwire is installed into newly placed brackets because your teeth and mouth will begin shifting. Soft tissues will also begin adjusting to the bracket system and can cause temporary pain. Dr. Hardy can prescribe you ibuprofen dosages to take during this adjustment period if necessary. Salt-water rinses can also help with soreness. It is not uncommon for your lips and gums to develop some mouth sores during the adjustment period. The soft tissues of your mouth are not accustomed to the roughness of the brackets yet, but they WILL adjust. In the meantime, a weak solution of warm salt water, swished several times a day can help. We recommend ½ teaspoon of salt per cup of water. Most patients will experience some discomfort for 4-7 days after they receive braces or after a wire adjustment. The bracket systems that Dr. Hardy uses at Belmar Orthodontics in Lakewood utilize state-of-the-art technology that is able to provide results with very light forces on your teeth to help minimize the discomfort you may feel. Teeth and the soft tissue structures of your mouth adjust to the bracket system and discomfort dissipates. Eating also becomes easier when your teeth are no longer sore. Commit to taking care of your braces, practicing good oral hygiene, eating safe foods, and keeping your regular adjustment appointments and you will find life with braces to be a breeze. 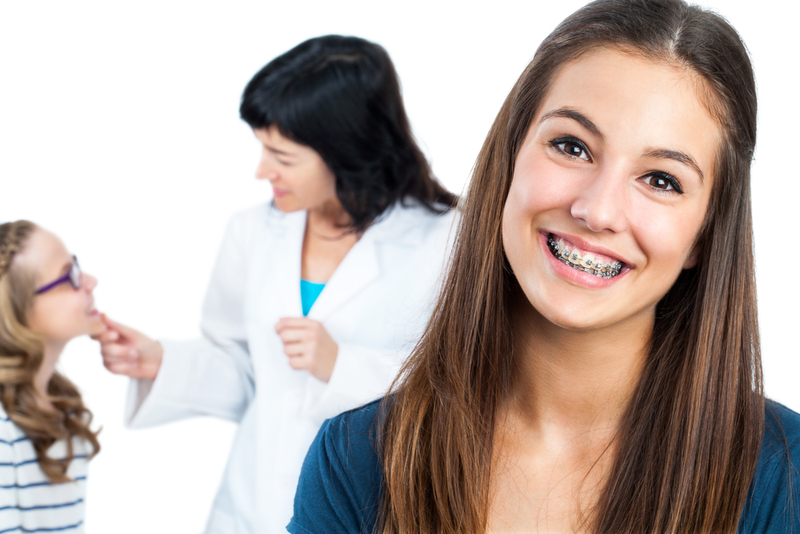 Most patients will be completely accustomed to their life with braces after a period of about a month. By six months most won’t even notice they are there. Temporary soreness should be expected after each adjustment, but these periods of adjustment mean that the braces are working for you. Your beautiful smile is being built! Wear your bands, take care of your teeth, and keep an open dialogue with our Belmar Orthodontics team when questions or emergencies arise and you will be out of your braces and flashing your brilliant smile in no time!